Genetic disorders are showing an upward trend. The social and economic impact of genetic disorders on individual, family and society is enormous. There is an urgent need to explore alternate strategies to mitigate the burden of genetic disorders. This is especially true with regard to developing countries such as India where there is a shortage of health personnel adequately trained in genetic counseling at present. Dental professionals have a unique opportunity to observe the development of preadolescent and adolescent patients during periods when important growth and development changes occur. The objective of this study was to review the existing literature on the role of dentist in genetic counseling with a critical appraisal on the current practices among dentists on genetic services in India, the need, scope, and future requirements. The literature on genetic services and genetic counseling was identified by searching the biomedical databases for primary research material by one investigator over a period of 8 weeks. The articles related to dentist's role in genetic counseling were assessed and discussed in the present review. A total of 239 resource materials were retrieved in the initial search. The literature from these sources was thoroughly scrutinized by the authors, and the literature (review articles, descriptive studies, or any form of study) focusing on role of dentist in genetic counseling was finally considered for critical appraisal in the present review. The role of genetics in health and oral health care has not received due attention of the dental practitioners who otherwise are in a crucial position in identifying the patients with genetic disorders and offer requisite counseling and referral to designated genetic centers. The short training courses for practicing dentists, faculty members, and a small change in dental curriculum to make provision for teaching genetics to undergraduate students may go a long way in filling the void created by these obstacles. Genetics is a scientific study of the mechanism of inheritance and causes of variation in living organisms related by descent. Although man has always been aware that individual differs and that children tend to resemble their parents, the scientific basis for these observations was given thrust during the past 150 years. The clinical application of this knowledge has become widespread with most progress made in the last 40 years. The first appreciation of heredity as a reliable expression of nature probably arose with the introduction of agriculture. Sir W. Lawrence in 1828 noted that “The hereditary transmission of physical and moral qualities so well understood and familiarly acted upon in the domestic animals, is usually true in man. A superior breed of human beings could only be produced by selection and inclusions, similar to those so successfully employed in rearing our more valuable animals.” However, the science of genetics is said to have begun with the public presentation in 1865 by Gregor Mendel of his research on hybridization of peas and to have become re-established with its rediscovery in 1900. A more specific measure of the impact of genetic disorders is their role in mortality and morbidity. Studies of children's hospitals which are referral in nature show a high percentage of genetic diseases among the causes of death. As for morbidity, Stevenson found in Ireland that 26% of all institutional beds, 6% of all consultations with general practitioners, and 8% of those with specialists were for patients with genetically determined disease. A study in the United States of all admission diagnoses to a pediatric service in a university hospital showed that 7.1% of all admissions were for diseases of clearly defined genetic origin and 31.5% were possibly gene influenced. The advent of prenatal diagnosis and the ability to detect an inborn error of metabolism, chromosome disorder, or congenital malformation in utero, early enough to allow termination of pregnancy, has added a new dimension to genetic counseling. In place of confronting parents with the choice of planning further children in full knowledge of high risk of abnormality or limiting their families, it is now possible in a rapidly growing number of disorders to monitor at-risk pregnancies and ensure that children born will not be affected. Genetic counseling fills a distinctive position in the complicated and varied arena of genomic medicine. Advances in genetic medicine create an even greater demand for expert health-care services. Genetic counselors help meet this need, serving in almost every major medical center and across the globe as an increasingly important resource for medical referral and quality patient care., It is important to cautiously utilize the scarce resources for prevention and care of genetic and congenital conditions. Historically, clinical genetic services were developed in major hospitals in large urban centers, in both developed and developing countries, to provide diagnosis and counseling to patients with, or at risk for, genetic diseases and congenital anomalies. In developing countries, the major bottlenecks to increasing access to genetic services have been fundamentally the shortage of trained specialists, the lack of appropriate technology, the scarcity of funding, and the lack of links with the primary health care level. Genetic disorders are showing an upward trend. The social and economic impact of genetic disorders on individual, family and society is enormous. There is an urgent need to explore alternate strategies to mitigate the burden of genetic disorders. This is especially true with regard to developing countries such as India where there is a shortage of health personnel adequately trained in genetic counseling at present. Professional and lay attitudes about the role of the dentist in the health sciences are changing perceptibly. The view that the activities of the dentist are limited to manipulations of the teeth is being replaced by the view that the dentist is an important member of the health team. There is an expanded responsibility for dentists in today's world, and a significant part of that responsibility involves the provision of genetic services: diagnosis and counseling. To be sure, medical colleagues may still ask why a dentist is in the nursery or elsewhere in the hospital and for the lay public may still ask what genetics has to do with dentistry or vice versa. But “the times, they are a-changing.” Opportunities provided by the human genome project to understand the genetic aspects of disease and to generate novel approaches to prevent, diagnose, and manage diseases have created new imperatives for basic science and clinical education in dentistry. To ensure meaningful application of genomic discoveries for preventing disease and improving clinical outcomes, the role of a professional workforce armed with leading-edge knowledge is a key to contemporary practice and education. Of equal importance is growing evidence of the dentist's role in recognizing not only dental and oral disorders but also systemic indicators of genetic disorders, making the dentist integral to the overall health and well-being of patients. New and challenging social, ethical, and legal implications are associated with the use of genetic information in the treatment and prevention of disease. Of the approximately 5,500 known inherited diseases in humans, more than 700 involve craniofacial malformations. Not all genetic anomalies are evident at birth. Dental professionals have a unique opportunity to identify these anomalies suggestive of major developmental malformations. Dentists who are able to recognize genetic disorders can also provide a valuable service to their patients by proper referral to a medical geneticist and/or genetic counselor. In the background stated above, this paper is an attempt to review the existing literature on the role of dentist in genetic counseling with a critical appraisal on the current practices among dentists on genetic services in India, the need, scope, and future requirements. The literature on genetic services and genetic counseling was identified by searching the biomedical databases for primary research material. The search for the relevant literature was made in the Cochrane database of systematic reviews, PubMed, LILACS/BBO, MEDLINE, SCIENCE DIRECT, and Google Scholar. The databases were searched for publications up to 2013, with key articles obtained primarily from MEDLINE. Internet clippings and online manuals were searched in Google Scholar. The thesis and government projects were searched in open access theses and dissertations: ProQuest Dissertations and Theses Database, EBSCO Open Dissertations, British library EthOS e-theses online service, and Library and Archives Canada. The search procedure was carried out for 8 weeks (from December 1, 2013, to January 30, 2013) by one investigator. The search terms remained broad to ensure that relevant studies were not missed. The following search terms were employed to retrieve the literature using the search engine. Congenital defects in orofacial region. The literature with these search terms anywhere in the title or abstract were considered for initial scrutiny. No language restrictions were employed. Role of dentist in genetic counseling. The results of literature search, along with the segregation into various parameters, are presented in [Table 1]. Although no language barriers were employed, the entire literature reviewed in the present work was in English, and the authors did not come across any published literature in a language other than English. The literature from these sources was thoroughly scrutinized by the authors, and the literature (review articles, descriptive studies, or any form of study) focusing on role of dentist in genetic counseling was finally considered for critical appraisal in the present review. 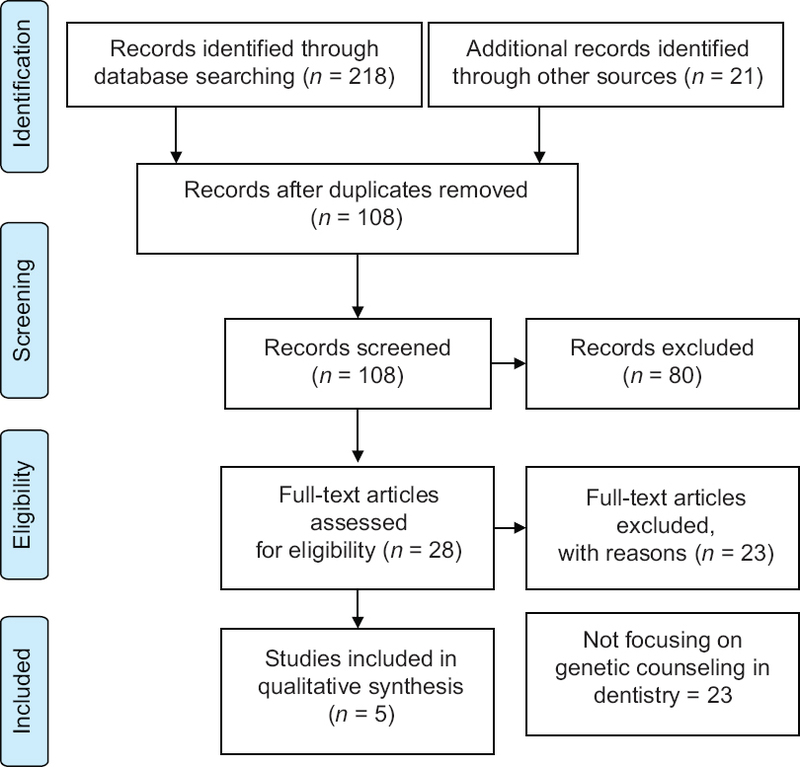 Although the literature search retrieved 239 resources, only five articles focusing specifically on dentists in genetic counseling were considered for final qualitative synthesis. These articles were published between 1980 and 2008. The results of literature search are presented in PRISMA flowchart [Figure 1]. The summary of five articles considered for final review in the present manuscript is presented in [Table 2] with key conclusions cited beneath. Figure 1: PRISMA 2009 flow diagram. Jorgenson while discussing on role of dentist in genetic counseling has concluded that failure to provide genetic counseling when it is indicated is malpractice. Report of panel 3 of the Macy study on genetics and its implications for clinical dental practice and education concluded that concepts and principles of genetics should move from being classroom content to being knowledge that is applied in the care of patients. Collins and Tabak in their review on the need for increased education in genetics for dental health professionals concluded that there is a need to increase education in genetics for dental health professionals. Behnke and Hassell evaluated what educational experiences in genetics were provided to students in US dental schools and dental hygiene programs in 2003–2004. They concluded that genetics will soon dominate the future of medicine and dentistry, and therefore, it is incumbent upon dental and dental hygiene education programs to provide genetic education for tomorrow's practitioners. Dudlicek et al. in their study assessed the status of genetic education in US dental schools. They concluded that the genetic education offered to undergraduate dental students was not standardized, and the content varied considerably among schools. These findings suggested that more emphasis on genetic education was needed in dental schools. In the same way that medical practice and health care in general vary in different countries and cultures, a number of features of genetic counseling may vary. For example, in some countries, genetic counseling is considered part of medical practice and provided by specially trained medical personnel; in other countries, nonphysicians are trained in genetic counseling to provide the service. At present, there is a shortage of health personnel adequately trained in genetic counseling in all countries but particularly in developing countries. Given the contextual differences in health-care, social, cultural, religious, and legal factors, the modalities for delivering genetic counseling, including the personnel who provide the service, should be left to each country to determine. Defining the minimum training required for health personnel to provide genetic counseling is the basic priority. Training primary health professionals (general physicians, nurses, social workers, etc.) in genetic counseling in developing countries would help to address these shortages. Behnke and Hassell conducted a study to evaluate what educational experiences in genetics were provided to students in US dental schools and dental hygiene programs in 2003–2004. The study revealed that out of 54 dental schools, only one required a formal genetics course before admission, and only six incorporated a required genetics course within the dental curriculum. 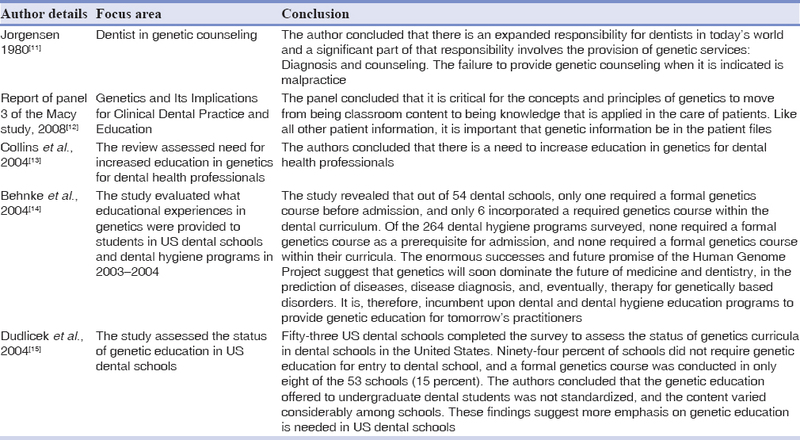 Of the 264 dental hygiene programs surveyed, none required a formal genetic course as a prerequisite for admission, and none required a formal genetic course within their curricula. The enormous successes and future promise of the Human Genome Project suggest that genetics will soon dominate the future of medicine and dentistry, in the prediction of diseases, disease diagnosis, and eventually, therapy for genetically based disorders. It is, therefore, incumbent upon dental and dental hygiene education programs to provide genetic education for tomorrow's practitioners. Dudlicek et al. assessed the status of genetic education in US dental schools. Fifty-three US dental schools completed the survey. Ninety-four percent of schools did not require genetic education for entry to dental school, and a formal genetic course was conducted in only 8 of the 53 schools (15%). The authors concluded that the genetic education offered to undergraduate dental students was not standardized, and the content varied considerably among schools. These findings suggest that more emphasis on genetic education is needed in US dental schools. This review discusses the role of dentist in genetic counseling with special emphasis on appraising the modifications that may be considered in training of dental graduate students in genetic counseling and avenues to best utilize the increasing dental workforce in the country for prevention of genetic diseases. Dental practitioners are well aware of the environmental and behavioral risk factors that contribute to poor oral health. As information about the genetic makeup of individuals increases, additional genetic susceptibility or resistance factors will be identified that influence the severity of periodontal and other oral diseases. Once these factors are identified, tests can be performed to identify those at risk, permitting practitioners to educate patients about the importance of their behaviors and tailor preventive strategies to individual patients. Oral health professionals need to be prepared to answer patients' questions and know where to refer a patient for additional information or counseling. This requires a basic understanding of the genetics of human disease, knowledge of the types of genetic testing available, and sensitivity to a family's concerns. An expert panel constituted to examine the issues related to dental curriculum provided the analysis and recommendations for contemporary dental curriculum, pedagogy, directions for clinical education, student assessment, and faculty development in dental education in the United States of America. The recommendations by this expert panel are discussed here with the feasibility of applying these recommendations in Indian scenario. The panel recommended a change in the dental school curriculum and clinical training to bring a change in the definition of dental practice. The change in the training program should aim at providing curriculum and clinical training in such a way that dental practitioners can precisely and consistently evaluate oral, dental, and craniofacial diseases using an understanding of the genetic basis of oral diseases and related systemic conditions and, when appropriate, seek clinical collaborations to address patient conditions and treatments. The due consideration of this recommendation in Indian scenario will bring a drastic change in the way dentistry is practiced at present and make dentists socially responsible in addressing the issues related to genetic disorders. The dentist with poor genetic knowledge will never be in a position to uncover the underlying genetic factors for various orofacial disorders as well as to apply genetic tests for susceptibility to common oral health concerns and structural oral-facial anomalies. An improved understanding of genetic susceptibility, lifestyle, and oral health risk factors allows a family's dentist to offer effective preventive and treatment strategies for oral diseases as well guide the patients to seek further assistance in designated genetic centers. The information from the Human Genome Project should be put to practical use. The dental practitioners should understand human genetics and carefully apply genetic information to diagnosis and treatment of patients. The basic knowledge on molecular biology of bone, periodontal structures, salivary gland, and tooth development should equip a dentist to implement innovative treatment approaches that differ greatly from dentistry's current surgically based techniques. Based on the recommendations of the Association of American Medical Colleges on genetic education, the following changes may be implemented in the existing dental curriculum to equip the dentist with some basic knowledge, skill, and attitude to offer genetic services. Oral health professionals should have a foundation of knowledge about genetic principles such as principles of genetic transmission, molecular biology of human genome, and principles of population genetics. This knowledge is basically related to the understanding of the structure and function of the genome in the cell and application of this genetic information in patient care. Skills that are important to dental professionals include the ability to take and update a family history, recognize signs of genetic disease and include this information in the differential diagnosis, and prescribe and interpret the results of genetic tests. Dental practitioners must appreciate the emerging uses of genetics in the prevention, diagnosis, and treatment of dental conditions. Dentists should realize their current limitations in the knowledge and continue to update knowledge and skill as information about genetics expands during their professional careers. The professional dental organizations such as Dental Council of India (DCI) and Indian Dental Association (IDA) may think of offering short-term training courses for the registered dental practitioners on genetics and the application of genetics in dental practice. The continuing dental education on the recent concepts in genetic basis of orofacial disorders organized on a regular basis at state levels through the state branches of DCI and IDA will go a long way in enhancing the knowledge, skills, and attitude among the practicing dentists on their role in genetic counseling and genetic services. There is a need to implement certain educational strategies to equip the upcoming dental practitioners in caring the patients with genetic disorders. The dental curriculum in India is a 4-year degree program with 1 year of internship. In the first academic year, the foundation knowledge on genetics and principles of genetics may be taught in few classes (hours) spread over the year by qualified specialists. In the second academic year, the dental graduates should be made to realize the importance of genetics in patient care and their social responsibility in reducing the burden of genetic diseases. The students should be taught about how the basic genetic knowledge can be linked to most of the diseases in the orofacial region in the third academic year. Here, they should understand the interaction between genetic and environmental factors in disease etiology and plan the treatment and prevention of the disease accordingly. Finally, the students should be taught on how to apply what they have learned in the previous 3 years in actual clinical practice. There may be some questions related to genetics in each formative and summative assessment in all the years. This will create a sense of seriousness in the subject, and upon graduation, the upcoming dental practitioner should be able to incorporate new genetics knowledge, apply diagnoses and treatment techniques, and address unanticipated issues surrounding the genetics care of dental patients. There may be many practical difficulties in implementing these educational strategies. These difficulties and the ways to overcome such difficulties are discussed. Challenges related to training of trainers: A teacher plays a vital role in imparting and motivating the students. The vast majority of dental faculty members in India at present might have had very limited education and experiences regarding genetics and the oral health care of patients with genetic conditions. Most faculties will have limited ability to utilize the genetic information contained in the health records in guiding the students due to their lack of expertise. It is not necessary for the faculty to become geneticists. They must be motivated to attend certain faculty development programs on genetics in oral health care. These programs may be offered on periodic basis in the institution. The faculty should realize the importance of genetics in oral and general health care such as a patient's gingival overgrowth might have a genetic basis. Only a genetic test could determine this, which would affect the patient's treatment. A trained and motivated trainer may play a significant role in preparing the upcoming dentists to apply the knowledge they acquired in their curriculum. The dental practice at present in India is offered mostly by private dentists on fee for service basis. The practice is mostly curative and rehabilitative with minimum attention paid on promotive and preventive dental services. The role of genetics in health and oral health care has not received the due attention of the dental practitioners who otherwise are in a crucial position in identifying the patients with genetic disorders and offer requisite counseling and referral to designated genetic centers. Each dental practitioner should have complete details of the genetic services center nearest to the area of his/her practice and may seek genetic services from this center as and when desired. The lack of trained geneticists and the scarce resources to implement genetic services to the entire population of the country are the major obstacles which call for alternate strategies such as training dental practitioners and other allied practitioners such as those practicing alternate systems of medicine. The short training courses for practicing dentists, faculty members, and a small change in the dental curriculum to make provision for teaching genetics to undergraduate students may go a long way in filling the void created by these obstacles. A strong desire to change the existing curriculum by professional bodies such as DCI is the need of the hour to translate this into reality. Grabber TM, Vanarsdall V. Genetics. Orthodontics Current Principles and Techniques. 4th ed. St. Louis, U.S.A: Elsevier Publishers; 2005. p. 101-2. Mossey PA. The heritability of malocclusion: Part 1 – genetics, principles and terminology. Br J Orthod 1999;26:103-13. Day N, Holmes LB. The incidence of genetic disease in a university hospital population. Am J Hum Genet 1973;25:237-46. Genetic counselling. Third report of the WHO expert committee on human genetics. World Health Organ Tech Rep Ser 1969;416:1-23. Carter CO. Changing patterns in the causes of death at the hospital for sick children. Great Ormond St J 1956;11:65-8. Roberts DF, Chavez J, Court SD. The genetic component in child mortality. Arch Dis Child 1970;45:33-8. Sutton HE. An Introduction to Human Genetics. 4th ed. San Diego: Harcourt Brace Jovanovich; 1998. p. 23-56. Brock DJ. Prenatal diagnosis and genetic counselling. J Clin Pathol Suppl (R Coll Pathol) 1974;8:150-5. Phillips SE. Genetic counselling. In: Encyclopaedia of Sciences. Eastern Virgenia Medical school, Norfolk, Virgenia, USA; 2001. p. 1-6. World Health Organization. Medical Genetic Services in Developing Countries. The Ethical, Legal and Social Implications of Genetic Testing and Screening. Geneva: World Health Organization, World Health Organization Press; 2006. Jorgenson RJ. The role of the dentist in genetic counseling. Birth Defects Orig Artic Ser 1980;16:139-45. Johnson L, Genco RJ, Damsky C, Haden NK, Hart S, Hart TC, et al. Genetics and its implications for clinical dental practice and education: Report of panel 3 of the Macy study. J Dent Educ 2008;72:86-94. Collins F, Tabak L. A call for increased education in genetics for dental health professionals. J Dent Educ 2004;68:807-8. Behnke AR, Hassell TM. Need for genetics education in U.S. Dental and dental hygiene programs. J Dent Educ 2004;68:819-22. Dudlicek LL, Gettig EA, Etzel KR, Hart TC. Status of genetics education in U.S. Dental schools. J Dent Educ 2004;68:809-18. Johnson LA, Cunningham MA, Finkelstein MW, Hand JS. Geriatric patient simulations for dental hygiene. J Dent Educ 1997;61:667-77. Dental Council of India. BDS Course Regulations. Dental Council of India; 2007. Available from: http://www.dciindia.org/dciregulation_2006_pages/BDS_Course_Regulation.htm. [Last accessed on 2013 Jan 30]. University of Michigan Center for Research on Learning and Teaching. Teaching Strategies: Case-Based Teaching; 2002. Available from: http://www.crlt.umich.edu/tstrategies/tscbt.html. [Last accessed on 2013 Jan 23]. National Center for Case Study Teaching in Science. Available from: http://www.ublib.buffalo.edu/libraries/projects/cases/case.html. [Last accessed on 2013 Jan 23]. Clancy JM, Johnson L, Finkelstein MW, Lilly GE. Dental diagnosis and treatment (DDx & tx): Interactive videodisc patient simulations for dental education. Comput Methods Programs Biomed 1990;33:21-6.